Hi there!!! I'm super excited about our third featured must-have in the Summer Style Series today, as this one might be my favorite. If you missed the others, here are featured look 1 and featured look 2 in the style series for moms on-the-go. If you're like me, I think most of us moms fall under two dress styles in our everyday lives as we shuttle kids around, run errands, attend meetings, shopping, etc. We either slum it up with yoga pants and a tshirt ("Who cares what I look like...I won't see anyone I know." Except, I ALWAYS see people I know! ), OR we make an effort to look put together with some denim, a cute top, and call it good. Well friends, the latter is where we find today's featured look...flowy tops. These aren't just any tops or tunics...I'm specifically referring to light, airy, sometimes sheer, tailored tops that are the perfect weight and look for summer. They're the blouses, that when thrown on with some jeans and cute shoes, look like you nailed it in the getting dress category. Flowy tops are fail-proof and require next to zero pre-meditation. 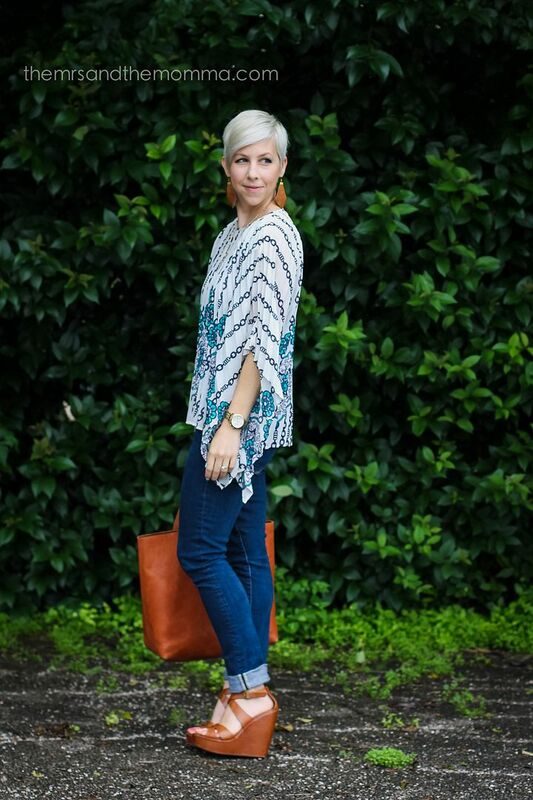 >>> As mentioned above, the easiest way to wear a flowy top is with denim...any color jeans work great with this look! >>> Other simple, yet laid back pairings are shorts (such as cut offs) and leggings (example I wore HERE). >>> Depending on how dressed up you want to go, flowy tops can be paired with sandals, flats, heels, wedges...really anything! >>> If the flowy top is a little too shapeless for you, pair a thin belt with it to cinch in the waist. >>> Flowy tops are forgiving (comfortable) without looking slouchy, which makes them even more versatile. 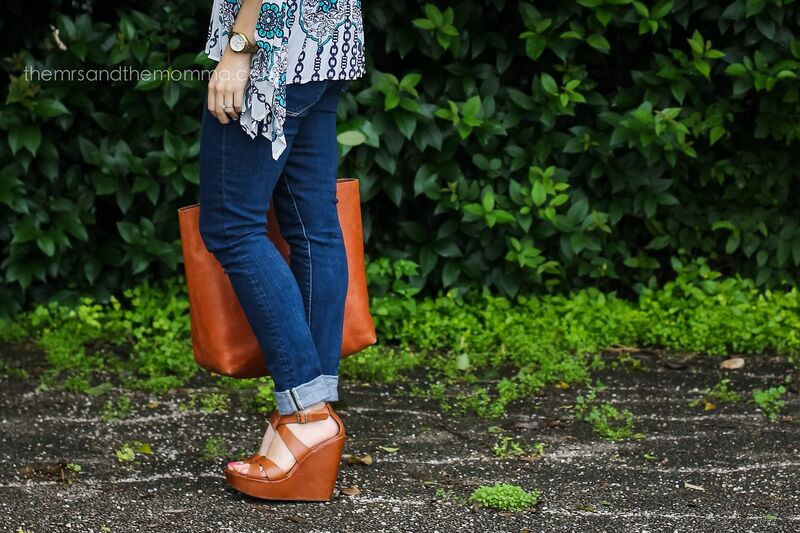 Go ahead and add more than a few to your closet to grab whenever. >>> For expectant mommas early in a pregnancy, these tops are the best for hiding a little bump. >>> Pattern-wise, look for prints of floral, geometric, and solids with a bit of detail (such as lace). >>> As you add flowy blouses to your wardrobe, keep in mind how well they'll transition to fall/winter simply by adding a blazer or cardigan and riding boots! 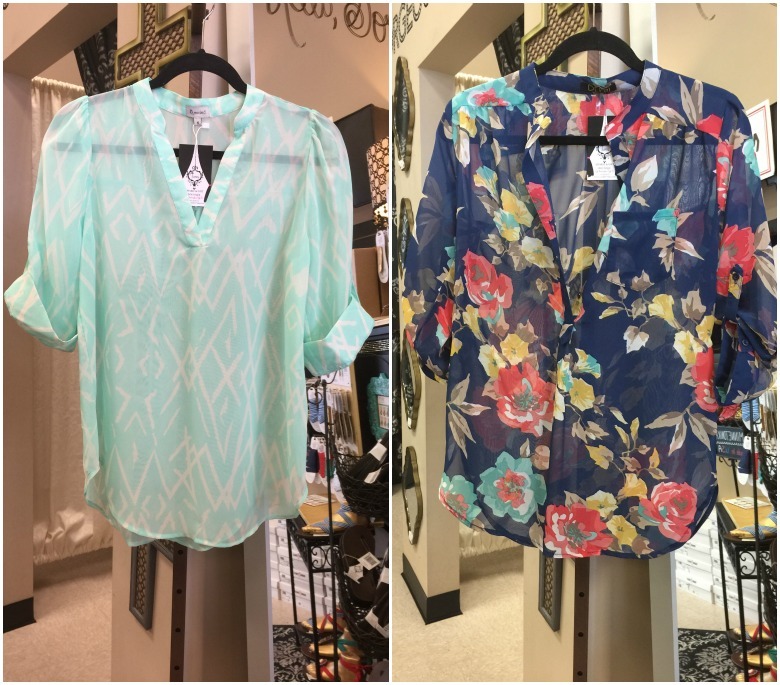 Those tops are absolutely perfect for mom attire! I totally agree, every time I'm in yoga pants and a tee shirt I ALWAYS see someone I know! Don't you hate that!?!? Thanks for stopping by!